We pull into the parking lot with a trunk full of guns. I have arrived at the Branford Gun Club along with Lenny Benedetto and his wife Virginia. Both are gun enthusiasts and active in the anti-gun control lobby. Lenny is the vice president of the Connecticut Citizens’ Defense League (CCDL), and his wife is the organization’s technology coordinator. They are out to show me that neither guns nor their owners are intrinsically scary, and today, they are going to teach me how to shoot. I have never shot a gun in my life, and I am jittery as we unload safety equipment and firearms. But before I pick up a gun, I need to use the bathroom. I ask where I can do that. A tall man with long dark hair—one of the couple’s friends chatting with us in the parking lot—crosses his arms and squints down at me, suddenly even taller. I was introduced to him as a reporter from Yale, and he seems reluctant to tell me where the bathroom is. Almost every gun owner I interview asks some form of this question. They all want to know where I stand, because many of them believe the media have heaped praise on SB-1160—the Connecticut General Assembly’s response to the horrific massacre at Sandy Hook Elementary School in December 2012—while unfairly portraying gun owners who oppose the law as irrational, paranoid, and crazy. They think I am that media. Many people refused to talk to me because they assumed I would take their words out of context and turn them into caricatures of the redneck American prominent in the liberal imagination. Meanwhile, these gun owners see gun-control supporters—and often liberals in general—as hopelessly ignorant and unfit to contribute to the dialogue because they, like me, have never even held a gun. The terms “grabber” (as in “gun grabber”) and “libtard” get tossed around a lot in reference to Democratic politicians and their supporters by members of CTGunTalk, an online forum where state gun owners discuss everything from politics to shooting competitions. If some of the forum posts confirm liberals’ stereotypes of gun owners, they also reveal how genuinely and deeply the state’s gun owners believe that they are under attack by reporters, by the legislature, and by their own friends and acquaintances who just don’t get it. On the other side, President Obama, Connecticut’s Governor Dan Malloy, and gun control activists across the nation have celebrated SB-1160, which gave Connecticut some of the strictest gun laws in the country. Signed into law last April, the legislation expands the ban on assault weapons to include dozens of additional models, tightly restricts the use of magazines (ammunition containers) that can hold more than ten bullets, and requires owners of such weapons and magazines to register them with the state. It requires background checks for all transfers of guns between owners, rather than only for purchases from gun shops. It also requires a permit to purchase long guns, which are braced against the shoulder. The law is jargon-laden and confusing in places, but clear in its intent. It exists to reduce the availability of the semi-automatic assault weapons often used in headline-grabbing mass murders: Columbine, Virginia Tech, Aurora, and Sandy Hook. SB-1160’s supporters see the law as a model that other states should follow. But to the Benedettos and other gun owners who support CCDL, SB-1160 encroaches on the rights they hold dear. It is too early to tell if the law will work. Exact figures are hard to come by, but the National Shooting Sports Foundation estimates that there are 300,000 assault weapons in the state. Only fifty thousand were registered as of mid-March, according to Lieutenant Paul Vance, spokesman for Connecticut’s Department of Emergency Services and Public Protection (DESPP), which is handling the registration. Now that the registration deadline of January 1, 2014 has passed, there is no way for owners of illegal guns to comply with the law unless they surrender their weapons. This means that there are hundreds of thousands of newly illegal firearms all over Connecticut. And, due to a loophole that co-sponsor Senator Don Williams says was completely unintentional but unlikely to be closed with additional legislation, no one is required to register assault weapons manufactured before 1993, when Connecticut enacted its first and more limited ban on assault weapons. This also means that plenty of older, powerful weapons similar to those used in mass shootings can still be legally bought and sold in Connecticut without registration. “Every time the politicians squawk, I go buy more,” the long-haired bathroom guardian declares shortly after we arrived at the range. When I ask them if there is any gun control measure they support, they laugh. “Well, I don’t think people should have grenade launchers,” Cheryl Lemos says. Encroaching on gun ownership rights, CCDL members believe, could lead to the erosion of one right after the other, and they think gun control supporters are blind to this fact. “I’m sure the folks at Yale would be having all kinds of conniptions if they took out the First Amendment,” Cheryl Lemos says. Reverence for the Second Amendment leads these groups distrust America’s government. New Haven resident Carl Roehrich, who brought a group of novice shooters from his church to the Branford Gun Club the same day I was there, says he purchased six “pre-ban” assault weapons after he found out about their unintentional legality. “I wanted to make sure that I would have these rifles specifically because they did not want me or any Connecticut citizen to have them,” Roehrich says. Roehrich believes that one day—perhaps not in his lifetime, but not in the far-off future, either—the American people will be forced revolt against their government, if the government does not first turn its guns against the people. When that happens, Roehrich is under no illusion that his assault rifles could effectively counter the most powerful and technologically advanced military in the world. Roehrich does not want to risk ceding his guns to the state, and he believes registering guns heightens the likelihood of eventual seizure. Benedetto at the 2013 Hartford rally. Photo courtesy of the Connecticut Citizens Defense League. The gun issue is political, but a gun itself is a machine. In theory, one should be able to regard guns apolitically, to utilize them without wading into the turgid partisan whirlpool surrounding them, to view them apart from the conflicting visions of America. Particularly at the Branford Gun Club, where members enjoy target practice and trap shooting while eating donuts together, I expect guns will be discussed primarily as a hobby. But every interaction with a gun presents an opportunity to reflect on an element of the law. The Benedettos are quick to emphasize that guns can be used safely. When he picks me up on Chapel Street that morning, Lenny Benedetto assures me that his SUV is “loaded up with guns.” Of course, the guns are not loaded. He laughs his distinctive belly laugh at the absurdity of his own tough-guy talk. It is a twenty-minute drive to the club. After we arrive, the Benedettos start taking out “eyes and ears”—glasses to improve visibility and provide ocular protection, and oversized earmuffish contraptions to muffle the sound of gunshots. They give me a pair of yellow glasses and a set of red earmuffs. I look like an army recruit undergoing basic training sponsored by McDonald’s. We go inside the range, a squat building where several people stand in a line to shoot at not-so-distant targets. As he opens the first case and pulls out a .22 caliber Firestorm pistol, Lenny Benedetto tells me the first rule of guns: “Never point a gun at something you don’t want to destroy.” The second rule: never put your finger on the trigger until you’re ready to shoot. The third: always assume the gun is loaded. The implicit political point Benedetto is trying to make is that people who do bad things with guns are unlike the Benedettos and their friends and acquaintances, who ought not be punished for the sins of those who refuse to respect and understand their weapons. As Lenny instructs me in basic gun safety, Virginia Benedetto, a soft-spoken Tennessee native with impressive aim, shoots a round with the Firestorm. The Benedettos selected this gun, which Virginia says she hasn’t shot in years, specifically for my instruction: it’s small, relatively harmless looking, decorated with a pink camouflage plastic covering near the handle, and can no longer be legally bought or sold in the state of Connecticut. When it’s my turn to handle the Firestorm, loading the magazine—a surprisingly difficult task that requires overcoming my fear that the gun will explode in my hand if I am too forceful—calls to mind SB-1160’s ban on the sale of magazines that can hold more than ten bullets. The Benedettos are concerned that many people who carry guns for self-defense on a regular basis do not know that their magazines, which often hold seventeen bullets, can no longer be filled to capacity except at home and inside gun ranges. All high-capacity magazines must be completely empty unless they are inside a gun, and the Benedettos can imagine a police officer with a hatred for guns slipping a bullet inside an empty magazine to incriminate a law-abiding gun owner. They also don’t buy the argument that it was generous of the legislature to allow gun owners to keep their high-capacity magazines instead of surrendering them to the state, and they think the politicians will keep pushing for more regulation. 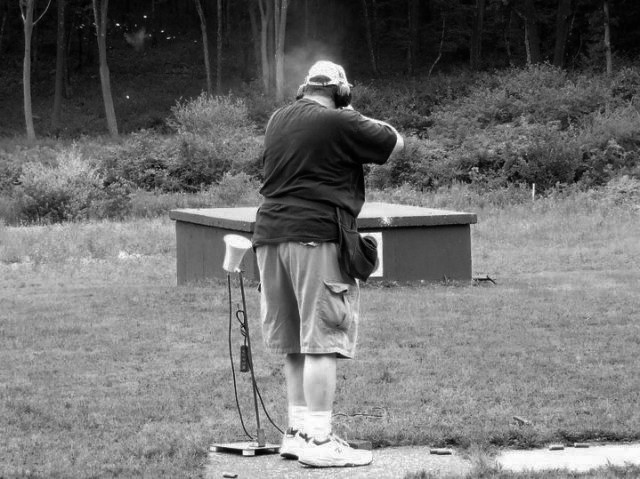 A gun owner at a 2010 CCDL event. Photo courtesy of the Connecticut Citizens Defense League. Last spring, the Benedettos joined other gun owners in testifying against SB-1160 before members of the state legislature. Gun control bills had not made it to the General Assembly’s floor since 1993, but things had changed. The Benedettos weren’t surprised when their efforts failed. Twenty-eight people, including twenty children too young to be named in the matter-of-fact autopsy reports released by the state, lay dead in the small, affluent community of Newtown. Twenty-six died of wounds inflicted by a young man armed with a Bushmaster XM15-E2S semi-automatic rifle legally purchased by his mother. She herself had been killed with a .22 caliber Savage MK II-F rifle. He ended his own life with a Glock 20SF pistol. 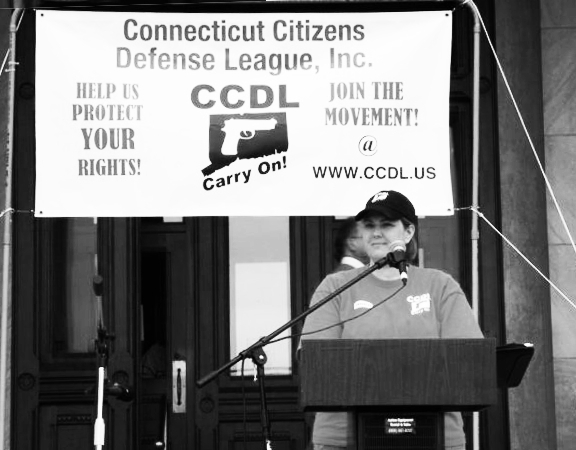 On the afternoon of the shooting on December 14, 2012, the CCDL issued a press release expressing grief and horror at the massacre, acknowledging that the discussion had already turned to gun control, and reminding everyone that aberrations like Newtown have nothing to do with organizations like theirs. The next day, Don Williams, president pro tempore of the state Senate, spoke with Senate minority leader and current gubernatorial candidate John McKinney, who represents Newtown. They agreed to create a special bipartisan process to craft the legislative response to the tragedy. Working with leaders from both parties, Williams and McKinney established three bipartisan task forces. One task force addressed school security, another focused on mental health, and the third dealt with guns. Each task force comprised eight Democrats and eight Republicans, and each met for several weeks of hearings and debate. As this planning took place, the CCDL condemned the gun control measures they foresaw. They issued another press release and published a message to members on their blog, exhorting gun owners to mobilize at the capitol when the time came. On January 28, 2013, at the largest of the task forces’ public hearings, hundreds of gun owners testified from 9 a.m. to 2 a.m. Several weeks later, the gun task force approved the new restrictions and an eighty-seven-page bill moved to the General Assembly. Because the bill was emergency certified—a distinction usually granted to measures responding to natural disasters or facing a tight deadline—SB-1160 went directly to a floor vote instead of passing through standing committees. It passed the Senate with 26-10 and the House of Representatives 105-44.Gov. Malloy signed the bill into law on April 4. Yet the Benedettos and many other gun advocates who testified are convinced that their concerns were not properly considered in part because the vote took place just a few hours after the legislature received the bill. Toni Boucher, Sturmer’s state senator, was the Republican co-chair of the school security committee. She called the entire process “tense and contentious.” But Boucher believes that people on both sides of the aisle made serious compromises. When the negotiations started, some Democratic legislators supported banning all magazines that could hold more than a single bullet. Republican involvement, Boucher says, prevented the most restrictive laws from being passed. “It was remarkable that on issues that sometimes can be so divisive in our national politics, we were able to have all four leaders of both parties co-sponsor and support that legislation,” Don Williams says. Sturmer and Bennett agree that the effort was bipartisan, and do not reserve their anger for Democrats alone. Both recognize that most Democrats in the legislature support gun control more than their Republican counterparts. Both feel betrayed by the Republican leadership that allowed Democrats to claim Republican support for their proposals. Neither buys the claim, advanced by Republicans like Boucher and McKinney, that Republican presence at the negotiating table improved the outcome for gun owners. In fact, Sturmer wishes Republicans had allowed Democrats to pass a law authorizing confiscation of assault weapons, which would have been easier to challenge in court. The highly restrictive laws Democrats would have passed without Republican resistance would have been unconstitutional, Strumer said, and therefore easy to tear down. “This legislation is the worst-case scenario,” Sturmer says. But for now, SB-1160 is here to stay. In January, Connecticut district court judge Alfred Covello ruled that the law is necessary to protect the safety of the public, but the CCDL is currently appealing its case. So far, SB-1160 seems to effectively toe the line of constitutionality. The Supreme Court has affirmed the right of individuals to own firearms for “traditionally lawful purposes” such as self-defense in the home. SB-1160 imposes additional regulations on gun owners but clearly allows them to continue using their guns for shooting practice and self-defense as they have in the past. For those who choose to comply with all the regulations, after they pay fees for registration and permitting, the biggest change is the number of bullets they can leave in their gun for the drive from home to the shooting range. Connecticut’s gun laws have traditionally been stricter than those in other states. In 2011, prior to the passage of SB-1160, the Brady Campaign to Prevent Gun Violence ranked Connecticut’s laws fifth-strictest in the nation, and the state had the sixth-lowest rate of gun deaths in the country. “Smart gun laws work,” says Ron Pinciaro, the executive director of Connecticut Against Gun Violence (CAGV). The other side can point to facts and numbers, too. It’s true that Connecticut has the sixth-lowest rate of gun deaths in the nation when suicide deaths are included, but most gun owners I talk to do not think gun suicides should count towards the statistics—these deaths would occur with or without guns. In addition, tighter gun laws do not necessarily reduce gun violence. According to the Brady Campaign, of the twenty-one states that had lower rates of firearm homicides than Connecticut in 2011, only Massachusetts had stricter gun laws. In the debate over gun control, objective truth is elusive, even when it comes to hard numbers. Some elements of the law are just coming into effect, and it will be years before anyone can assess the impact. Statistics can be massaged and cherry-picked, and causation does not follow from correlation. Plus, even defining seemingly simple words such as “violence,” can be difficult. Is it violence, Sturmer asks, when a police officer shoots a criminal in the act of fleeing or committing a crime? Yes, I tell him. Sturmer tells me I need to learn the true definition of violence, which he thinks requires an action to be undertaken with the intention of hurting another out of selfishness. Furthermore, the opposing sides frequently employ the same analogies and thought experiments to reach completely different conclusions. I ask Pinciaro whether any of the elements of SB-1160, as it has been implemented so far, would have prevented the actions at Sandy Hook. He says this question misses the point because not all violence is preventable, but that does not mean we should not pass laws against violent acts. Cheryl Lemos of the CCDL makes the same claim to explain her opposition to SB-1160: even banning guns would not end murder, so we should not restrict guns in an attempt to reduce violence. A major issue facing the success of the law is its enforceability. Though everyone I met at the Branford Gun Club said they had registered their guns, most owners of assault weapons haven’t. Yet Connecticut’s Department of Emergency Services and Public Protection (DESPP), which oversees the state police force and keeps records of firearm registration and pistol permitting, has not announced any plans to confiscate guns or prosecute those who failed to register their guns. SB-1160 made possession of an unregistered assault weapon a Class D felony, punishable by one to ten years in prison. The state keeps records of people who undergo background checks to purchase assault weapons. So, theoretically, DESPP could cross reference those records with the registration forms they received. “We’re not even stepping in that direction,” DESPP spokesman Paul Vance says. The records of background checks and pistol permit applications could have allowed the state to directly notify gun owners of the new requirement to register. Boucher says she contacted DESPP in August to ask the department to do that. It didn’t, but individual legislators publicized the law heavily. Still, some people may have fallen through the cracks. Benedetto says he has met several people who didn’t register simply because they didn’t hear about the changes. He is concerned that unwitting gun owners might be charged with a class D felony while being questioned about a lesser offense. David Hartman, media liaison for the New Haven Police Department, says it would be unfeasible to go door to door to track down weapons, so picking up gun owners in the course of routine police work is exactly what will happen. Can a law be considered effective if it is not truly enforced? Pinciaro and Williams say yes, because the ban and registration requirement together will reduce the likelihood of assault weapons falling into the illegal gun trade, and some paper trail is better than no paper trail at all. But if the state won’t expend resources to enforce the law, just how important does it really consider that paper trail? Actively searching for weapons and arresting offenders might be politically unpalatable, but refusing to do so sends a strong message that it doesn’t actually matter whether the law achieves its aim, lending credibility to gun owners’ arguments that SB-1160 was just a political show. Most gun owners I spoke to have maintained skepticism about the state’s intentions, but they are steeling themselves for the crackdown that may or may not come. The CCDL’s membership has grown from about 1,500 members to 13,000 over the last two years, and they are ready to resist. The author tries her hand at shooting a gun. Photo courtesy of Isabelle Taft. Gingerly holding the pink camouflage Firestorm, I manage to slap the magazine into the gun. It’s time to shoot. Lenny tells me to form an isosceles triangle with my body. I’m not quite sure what this means, but the couple approves my stance: feet apart, arms straight out, elbows locked. Lenny tells me to lean forward. Point the sight where you want the gun to fire. Squeeze the trigger with the pad of your index finger. Wait for exactly the right second to fire before realizing that second won’t come. Fire. 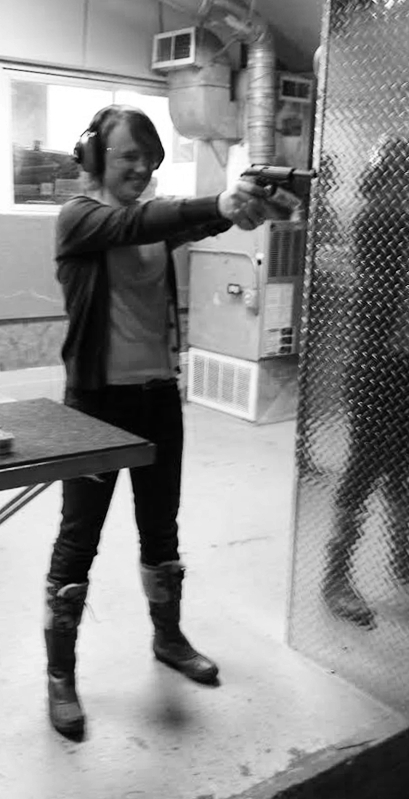 The moment is loud but anticlimactic, and mostly I feel relieved that I am capable of shooting a gun. I go through a few magazines, and several times I get pretty close to the bull’s-eye, which isn’t saying much because a helper moves the target close to where I’m standing. It still feels good, and the Benedettos are encouraging teachers. I smile when I quickly fire off a few shots that all nearly meet their mark. My target is designed so that when a bullet pierces the black paper, a neon pink, green, or orange ring appears around the hole. The rings look like Skittles. But a different kind of target sits on a table near the front of the range: a bullet-pocked plastic model of a pale human torso, smeared with red paint imitating rivulets of blood streaming down a chest. Perhaps a gun is not inherently a tool for evil, but despite gun owners’ assurances that shooting is a wholesome hobby, the bloody chest makes me think the gun’s capacity for violence is part of its appeal. I practice indoors for a while and then go outside to watch Virginia Benedetto shoot down bright flying orange discs called pigeons. After about four hours, the Benedettos drive me back to campus. I carry as souvenirs my pastel-dotted target and one of the pigeons I failed to hit with a shotgun. The Benedettos shrug off my thanks and say they’re always happy to take first-timers shooting. I walk back to my dorm and pull the target sheet out of my purse. I toy with the idea of hanging it up, but the colorful rings would dominate the white wall like a trophy. Still, I intend to keep it. Fair and well researched. Nicely done. Great article, the most balanced I’ve read. Great story, I think the only quote you missed in your day at the range is “The only way to stop a bad person with a gun, is a good person with a gun”. Forget about gun restrictions, there is more good people than bad and enough to overcome any evil in the world in this country alone. ““Smart gun laws work,” says Ron Pinciaro…” He wouldn’t know a smart law if it hit him over the head! That was a fair article. The only thing I would mention is that when he gave you the first three rules of gun handling, he was not making a political statement. Those are three specific rules by which all responsible gun owners live. Gun Saftey is priority #1 at all times when working with firearms. Previous Previous post: All Roads?